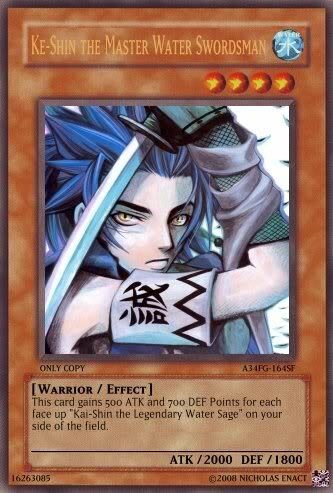 Description/Effect: This card gains 500 ATK and 700 DEF Points for each face up "Kai-Shin the Legendary Water Sage" on your side of the field. 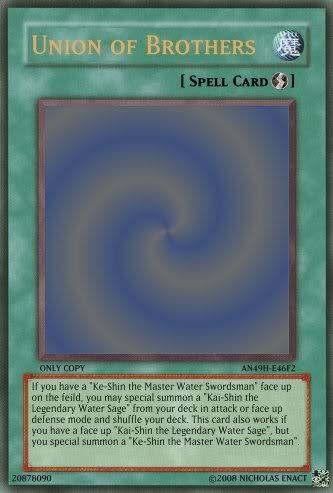 Description/Effect: This card gains 1000 ATK and the 500 DEF for each face up "Ke-Shin the Master Water Swordsman" on your side of the field. 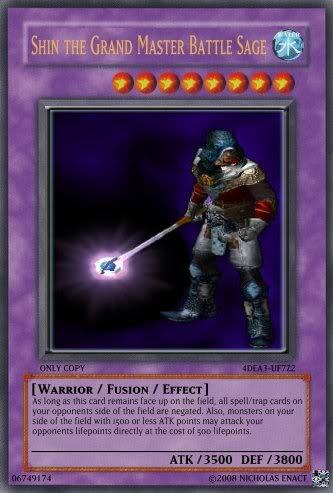 Description/Effect: As long as this card remains face up on the field, all spell/trap cards on your opponents side of the field are negated. Also, monsters on your side of the field with 1500 or less ATK points may attack your opponents lifepoints directly at the cost of 500 lifepoints. Description/Effect: If you have a "Ke-Shin the Master Water Swordsman" face up on the feild, you may special summon a "Kai-Shin the Legendary Water Sage" from your deck in attack or face up defense mode and shuffle your deck. 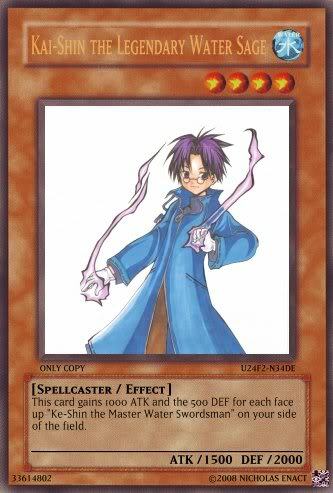 This card also works if you have a face up "Kai-Shin the Legendary Water Sage", but you special summon a "Ke-Shin the Master Water Swordsman".